It’s wreath time! First, let me begin with saying that I do not normally destroy books. I love books, but I sacrificed a “not so good one” to complete this project. I also really like making things out of paper. I wanted a simple and pretty wreath. After you have your cardboard circle prepared, fold the book pages with an accordion fold. Combine 3 book pages together, pinching the center of the accordion fold. 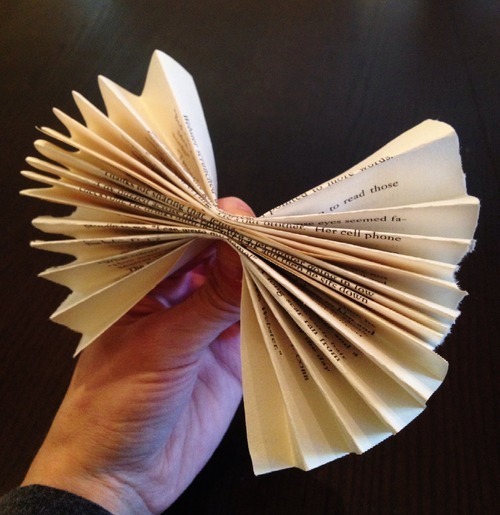 The folded pages should resemble and butterfly. 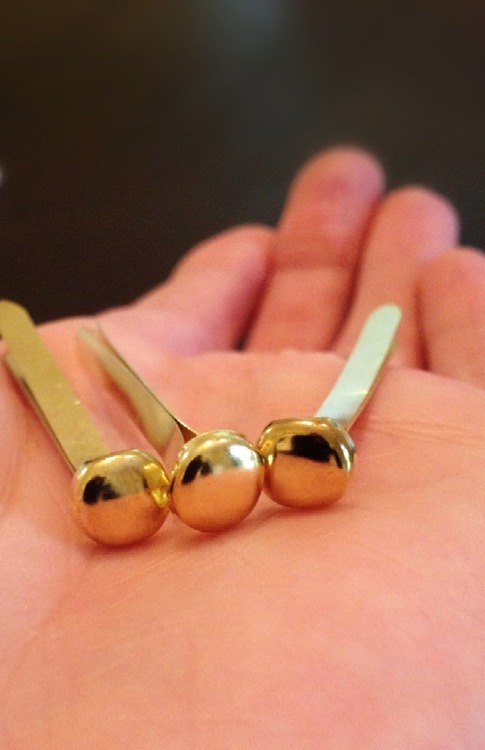 Get out your metal fasteners. 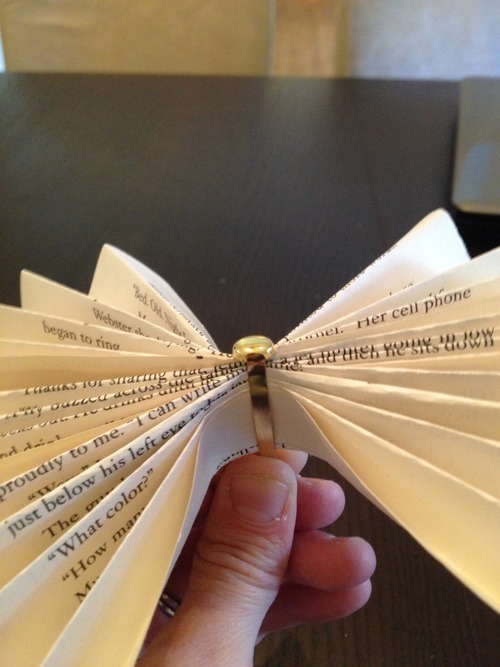 Wrap one fastener around the the book pages and pinch the bottom together. 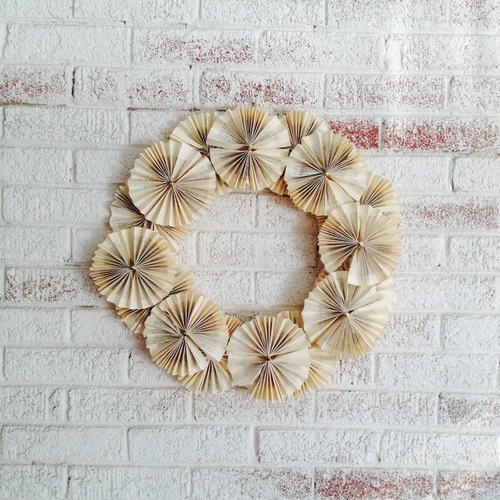 Now, put on a good movie and make some paper blooms until you have enough to complete your wreath. They paper blooms do not have to be perfect, just pretty. I used hot glue to attach the paper blooms to the cardboard circle. Arrange the blooms to make your wreath. Ta Da! That is a beautiful wreath! I love the color when you use book pages. Thanks Karen, I think the color gets even better as the paper ages. I love book page projects so much and this one turned out so so cool! Please stop by and share at our link it or lump it party going on right now! Thanks Amy. 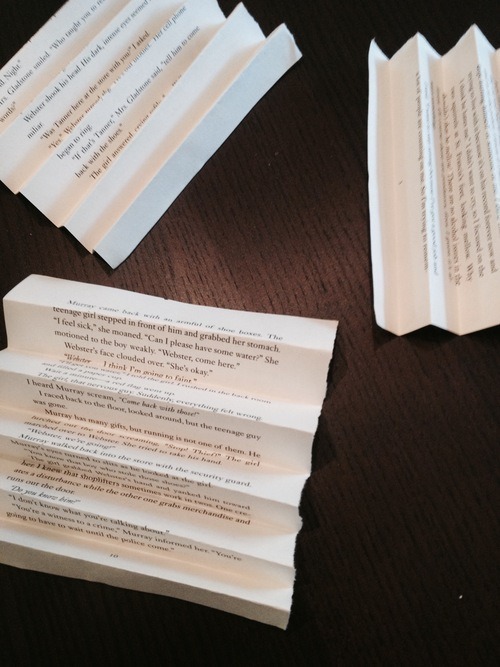 I love working with book pages too. I will absolutely join your link party. Love this! The pinwheel look is fab! This looks fabulous! You got my mind spinning…how about tissue paper to use for birthday? Love this! Coming over from the Carrie This Home LInk-up. Hey Ashley, Tissue paper could work really well for this project. I love this idea, it looks so neat! I am going to try this, I’ve pinned your post. I saw you linking at Uncommon Designs. Love your wreath!! Such a great idea, I think I might have to make one for myself! Thanks Mellisa! By the way…nice last name. I love this Carmody! It is so simple and pretty. I’ve always wanted to try a book page project. Thanks for the inspiration and for linking up at The Makers. I love this wreath so very much. I’m definitely going to have to try it for our office wall! Be sure to stop by our link party tomorrow because I’ll be featuring this project!! 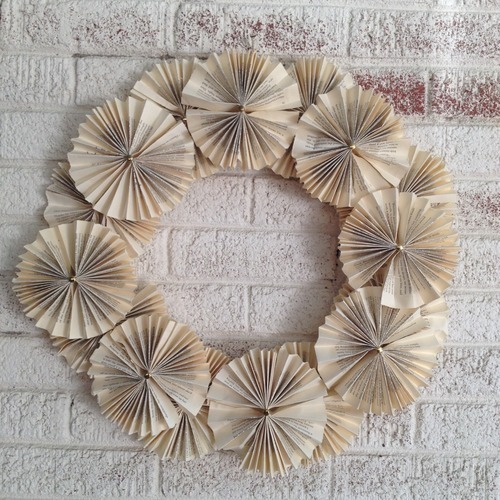 Love your book page wreath Carmody and thank you for sharing at Shabbilicious Friday this week. I’m delighted to be sharing it at tomorrow’s party. I hope you’ll pop over and pick up a ‘SAB featured’ button. Kerryanne, you have made my day. Thank you so much.